Here is a recipe for a simple frosting you can use to top deserts. The Slovak name for this topping is jahodová pena which means strawberry foam. Depending on how long you beat it, you end up either with something like whipped-cream that you can mix fresh fruits into for a quick sweet snack. As you beat the foam longer, it gets stiffer and more suitable for decorating cakes and deserts. 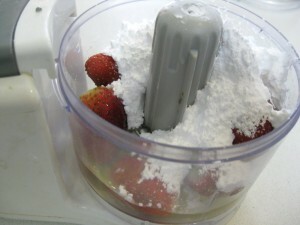 Combine the strawberries (jahody), egg white (bielok), powdered sugar (práškový cukor), and lemon juice (citrónová štava) in a blender or a food processor. Blend everything together. The ingredients will first turn into a soupy liquid. 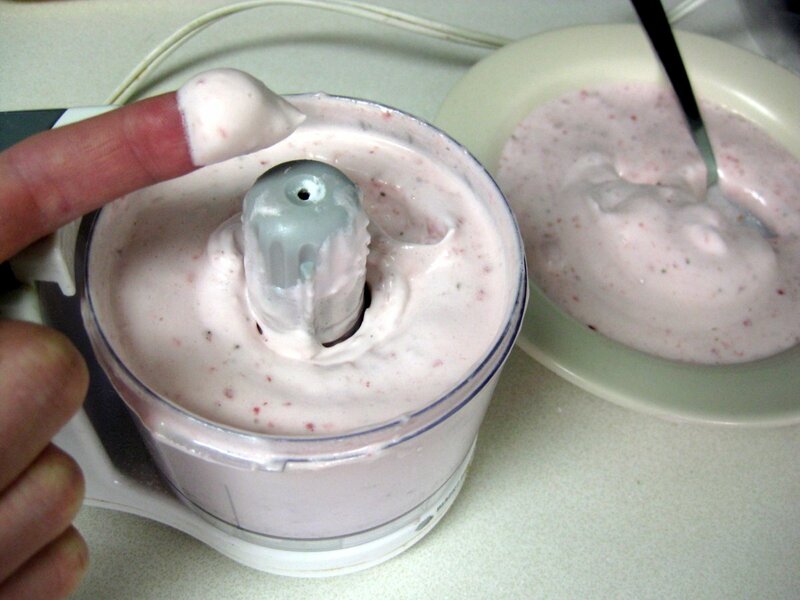 As you keep blending you’ll notice both the volume and the stiffness increasing. The volume increase is quite dramatic – I am estimating about four-fold. 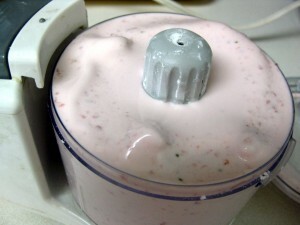 Which means that my food processor was way too small. By the time the foam started spilling over the top, the consistency was still thin, yogurt-like. So I transferred half out into a bowl and kept blending. After about 10 minutes of blending I had foam thick enough to hold shape. This is where I stopped, since I wanted something that can be easily spread on as a topping onto šišky (Slovak donuts). Finger-licking good! This looks delicious. It would be great with donuts. Thanks! The problem now is that I have waaaaay too much of this stuff left over. I ended up using only few tablespoons for those donuts. I am gonna try turning the rest into a smoothie. My wife remembers this from her girlhood in Slovakia. They used strawberries from the forest, much smaller than the ones sold in the supermarkets. And they used forks to beat the eggwhites–no food processors then. She also says it’s good with sisky. I know, we always end up with so much of it! Our favorite recipe for the extra is frozen Jahodová Pena over a baked crushed walnut mixture – yum! Combine 1c Flour, 1.4c Br. Sugar, 1/2c. Chopped Walnuts, 1.4tsp. cinnamon, and stir in 1/2c/ melted Butter. Stir until well-blended. Transfer mixture to Lg. Baking tray. Bake @350F for 20 minutes, stirring often. Mixture will should be crumbly. Let cool. Distribute half the nut mixture evening into a deep baking dish or cake pan. Spoon in your Jahodová Pena and sprinkle the remaining nut mixture. 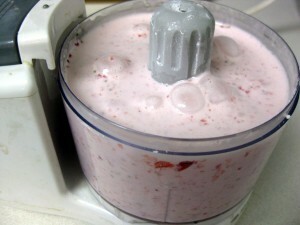 Cover and freeze for at least 8 hours; remove 20 minutes before serving. Looks delicious, Lubos – do you think that this would work as a filling for laskonky, or would that be a rather “non-traditional” application? not really Sue. In additition you are not eating the whole egg, just the white. Buy a good fresh organic eggs and you will never have a problem to eat it raw. Hey, I am 70 years old and never had a problem eating or drinking the raw eggs.